The Indian name for 14,408 foot Mount Rainier is “Tahoma,” translated as “That Frozen Water.” I was raised in the city named a variant, Tacoma." My childhood home was located about forty miles as the crow flies from the peak. I could see it on any clear day. I hope that this story of three men and the mountain reminds you of your own special times on Rainier. Man #1: my Dad, Clarence Reeck, loved Mt. Rainier. Three or four times every year, beginning in the 1940s, he took Mom, me and my brother to “The Mountain,” as we and all Tacomans called it. In the winter we’d sled or ski in the forty-foot deep winter snowpack at Paradise. In the summer we’d hike and camp out. In the fall we’d pick wild huckleberries near Reflection Lake. Once, Dad went to the mountain without the family. With a team, he climbed to the top, or “summited,’ as mountaineers say. Man #2: me. I never tire of Mt. Rainier. I may find something intriguing, like an attractive rock, or something fun to do, like running and sliding on an icy road. 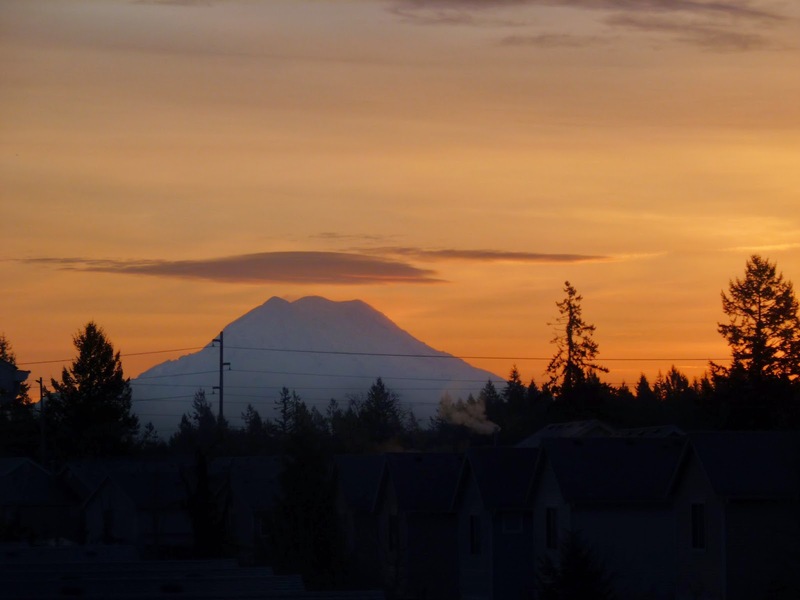 However, I find greater pleasure--spiritual pleasure, really-- in simply being there on Rainier’s slopes or gazing at it across an enormous valley from a neighboring peak or ridge. I detail several Rainier adventures and explain the meaning of Rainier for me in my book, Growing Green Two Ways! Mt. Rainier appears on the book cover because, for much of my life, this landmark has dominated the eastern horizon from my homes to the west. Man #3. On Friday, July 18, my son, David, successfully summited on his third annual attempt. "Congratulations, Dave!" On his two day grind he wore mountaineering gear and carried more gear, food and water. Approaching 11,000 feet, 6 or 7 people in his group grew ill and had to turn back. Dave and three others carried on. They climbed steep rocky slopes, crossed crevasses as wide as 8 feet, and scaled up tilting snowfields. They summited at 8:30 a.m. Friday, July 18, with Dave in the lead as the rope team entered the broad crater at the top of the mountain. After an hour of much-needed rest, the group began the descent with Dave in the lead again. The guide was last in line to safeguard the others. The group crossed a wide crevasse. Rangers had placed an aluminum extension ladder across it. They crossed other wide crevasses on snow bridges. Back at Camp Muir (10,800 feet) they were tired, dehydrated and hungry. Dave rested up and repacked his gear for an hour, then descended to Paradise and his car. If you like the story it's easy to pass it on. Click a “share” button below.